Located only minutes from Walt Disney World, Liki Tiki Village is a lush, 64-acre Polynesian-styled paradise. Gorgeous, spacious rooms, a jaw-droppingly enormous waterpark, easy access to Orlando and Kissimmee hotspots like Universal Studios and Walt Disney World (just five miles away! )- as well as outdoors opportunities for fishing, horseback riding, and boating- you name it, Liki Tiki Village has it. Family friendly and fun for all ages, this resort will allow you to make the most out of your Florida vacation any season of the year. Whether you’d like to kickback poolside with a book, visit Harry Potter World for some Bertie Bott’s Every Flavor Beans, stop by Disney’s Animal Kingdom for a Safari ride, golf on some of the best courses in the state, go swimming with dolphins, or explore the breathtaking Florida nature preserves and shimmering lakes, Liki Tiki Village- with its prime location and elegant accommodations- is the place for you. Situated just minutes from Highway 192, guests enjoy easy access to a huge selection of restaurants, shops, and supermarkets. Got golfers on the trip? No problem! Liki Tiki is conveniently located under seven miles from the Mystic Dunes Golf Course and is another convenient drive away from some of the most popular courses in Central Florida, including Southern Dunes, Ridgewood Lakes, Legends, Stoneybrook West, Diamond Players Club, Orange County National, Highlands Reserve, Champions Gate, and Reunion. Best of all, the Resort is located near all the best theme parks Orlando has to offer, with Walt Disney World just down the road and vacation hotspots like Universal Studios and SeaWorld less than 40 minutes away! This gorgeous two-bedroom, two bathroom unit- tastefully decorated to transport guests into a tropical paradise- includes a fully-equipped, warm-toned kitchen with coffee-maker, refrigerator, toaster, cookware, blender, microwave, dishwasher, stove, and bar seating, great for a quick snack or homemade meal. Enjoy breakfast around an elegant dining table (seats 6), or relax in your sprawling living room, which features a queen size sofa-sleeper and a large flat-screen TV. A washer and dryer is also available for quick laundry clean up. The master bedroom features a king-sized bed, large flat-screen TV, and a sumptuous marble bath, perfect for a relaxing soak after a day out in the waterpark or at one of Orlando’s many thrilling theme parks. The guest bedroom features two comfortable twin beds as well as its own private TV. The secod bathroom includes an elegant glass-door shower paired with lovely caramel tones and tropical accents. Please note: Some of the two bedroom units are town homes and include stairs. 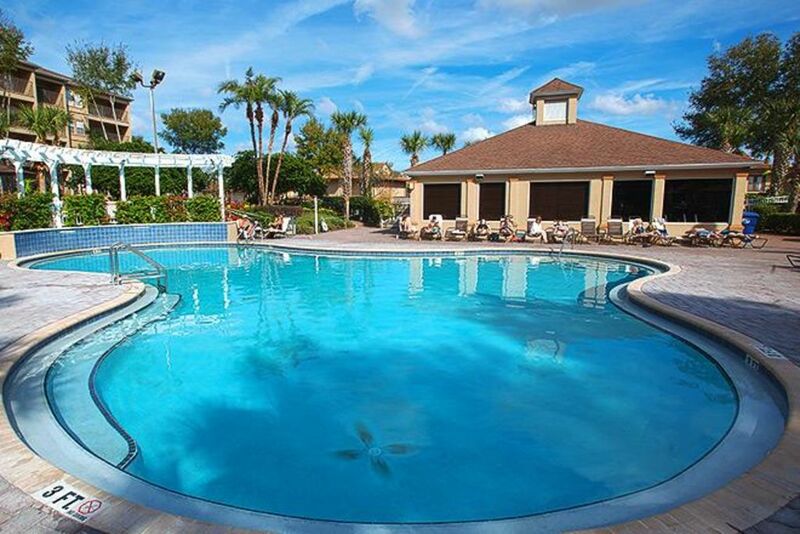 Liki Tiki Village Resort features luxurious rooms, a five-star location near Orlando’s best theme parks and Central Florida’s best lake areas, and an outstanding on-site waterpark which will have the kids reluctant to even leave the resort! Relax in one of their two heated pools or head over to Liki Tiki Lagoon, an enormous 220,000 gallon waterpark which features a themed water playscape including a wave pool, 5 water slides, an erupting water volcano, a waterfall, a toddler’s area, spouting tiki heads, and a magical dancing fountain! Once you’ve dried off, head on over the The Harbor for a game of mini golf or shuffleboard, then cruise the lake in a paddle boat, taking in the beautiful, Florida landscape. Lounging areas are scattered throughout the park, so feel free to sit back and relax with your favorite book while the kids splash and play. Liki Tiki provides arts and crafts for kids throughout the week, and two deluxe hot tubs for the adults. Don’t forget to stop by Shipwreck Sally’s Bar and Grill for a treat or full meal, unless you’d prefer to order a pizza from Sal’s Pizzeria and enjoy it in the comfort of your home away from home! Thank you so much for taking the time to share you experience with us and that you enjoyed your stay.. We work hard to make our guests happy and appreciate your feedback! We hope to see you again real soon! Appartment was comfortable, however could be more equipped. Could also be upgraded, Specially the living and dining rooms. Nice space for families, lots of cockroaches in our room. I feel sorry for people who get suckered into buying these places and are left to the mercy of poor property management. The A/C worked very well and so did everything else in our two room apartment. They don’t clean your room like they do in a hotel. Resort was clean, comfortable, and security was everywhere! We love the Liki Tiki and can't wait to visit again next year! The rooms are priced right and there is loads for the kids to do. The room is clean and spacious and well stocked with supplies. This was our 5th year going and my family loved it again. Night swimming is great with two of the three pools staying open very late. The kids play mini-putt, ride the suri bikes and play sports as many times as they want without us having to fork over cash for each thing they want to do. That adds up to HUGE savings. We often don't even go to Disney when we come down because the activities at the hotel keep them entertained. Its about 20mins max from Disney. The staff is very friendly. They updated a number of amenities this year and were in the process of updating some of the main buildings while we were there which is nice to see that they are reinvesting. Be aware of is that there is a resort fee (about $18/day) when you show up to pick up your room key. They do let you know this but why don't they just include it in the price? Sales is why. But don't let that stop you, just be aware of it so your not surprised and end up starting your trip on a sour note. We do not accept any free promotions, discounts or listen to the 90 min sales pitche (even when offered $100 prepaid visas and cheap tickets). We want to keep our vacation stress free. The money is enticing but the speel they go through is always way longer than 90mins and it is high pressure sales at its worst. It's just a stress we don't need when on vacation. We will definitely stay here again and again! We’ve stayed here twice before and loved it. This time, we were put in a unit that was in much need of updating and was not clean. We were quite disappointed. Also, we upgraded the room by calling the resort directly and it took a phone call and several emails to get home away to refund us the original reservation after the upgrade. OTHER THINGS TO KNOW - Check in Time: 4:00 pm - Check Out Time: 10:00 am - All Guest Suites are Non-Smoking - Minimum age requirement for check-in is 21 years of age. - Pets are not permitted and strictly enforced with the exception of Service Animals. - Hotel Guests: A photo identification, credit card for $100 security deposit and a nightly rate of $22.95 plus tax Resort Fee* will be required at check-in. (cash is not an acceptable form of deposit). This property charges a mandatory resort fee due at check-in. Please check listings for details. Rates subject to change. Click "Book it Now" for rates and availability. Reservations may be cancelled up to 8 days prior to arrival. A cancellation fee of 25% of the reservation will be charged. Cancellation requests made 7 days or less prior to arrival are non-refundable.